"To the Gomez family, my deepest condolences on the passing..."
"Celsa and all Mae's family. Eternal joy be Mae's with the..."
Mae was born the youngest of eight children to Alex and Laura Larive May 2, 1921 on the family farm in St. Onge, SD. At age 15, she lost her mother which required her to take charge of the household for the farm. Also at that time, she met her future husband, Frank G. Gomez at a dance in Lead, SD and it was love at first sight. They married on Sept. 23, 1939 and began a life filled with six children, Celsa (Pete) Johnson of Ocean Park, WA, Francis (Esperanza) Gomez of New York City, Dennis (Loretta) Gomez of Chester, CA, Loren (Enedelia) Gomez of Selah, WA, Gloria Mathews and finally, Anthony John, AJ (Annette) Gomez, both from Vancouver, WA. She was blessed to have 12 grandchildren, 16 great-grandchildren and four great-great-grandchildren. Like so many during the war, they came to Vancouver in 1942 to settle here the rest of their lives. 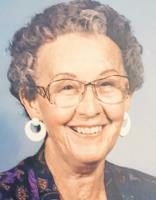 They loved to dance and play cards and enjoyed many friendships over the years. Mae worked at the cannery peeling pears in the summer to supplement the family income and then worked at Nabisco for 18 years. After they both retired, they enjoyed pulling their trailer and meeting many more friends. They were always involved in their parish and their community and were proud to be "Vancouverites". Mae's life changed drastically with the sudden death of her husband, Frank, in August 1988 and she carried on volunteering even more with the church and community. She received the "1995 Evergreen Award" from the City of Vancouver for her work with Meals on Wheels and was always able and ready to help at her Parish. Diagnosed in the early '90's with macular degeneration, she had to scale down her volunteering and eventually found it necessary to leave the family home. She moved to the Phythian Home where she spent her last seven years, still playing pinochle, exercising with the group and walking each day. She stayed physically active and mentally alert until her passing at age 96. She loved her family and friends and always welcomed visitors into her home. A Celebration of Life will be held at Our Lady of Lourdes Church, 47th and Franklin, on Sat., July 29 at 10 a.m. with a rosary prayed at 9:15 a.m. before the celebration. Lunch will be served in the Parish facility after the Mass. At her request, in lieu of flowers, please send donations to St. Vincent dePaul, PO Box 644, Seaview, WA. Mae's ashes will be inured with her husband's on the occasion of their 78th wedding anniversary at Mother Joseph Cemetery Columbarium on Sept. 23, 2017. Mae was proud to be a Catholic and a Christian. She encouraged us all to share our faith, to pray proudly before meals. She prayed her rosary daily and was a faithful servant of God. Mae has asked all who knew her to spread the word: "Be Kind; Be Gentle; God Bless." Hamilton-Mylan Funeral Home was entrusted with her arrangements.